An icon of New York City’s Black cultural community has joined the ancestors. Aminisha Black was one of the founders, in 1969, of The EAST, a groundbreaking cultural and educational organization rooted in the self-determination ethics of Black Cultural Nationalism. Her love/work contributions there – and afterward to the larger community – will long be remembered. Born Frances Lee in Pendleton, South Carolina in 1940, Aminisha was the only child of Lena and Clarence Lee. She moved to New York City in her early twenties and soon became involved in the cultivation of young minds – an endeavor that would become her lifelong passion. 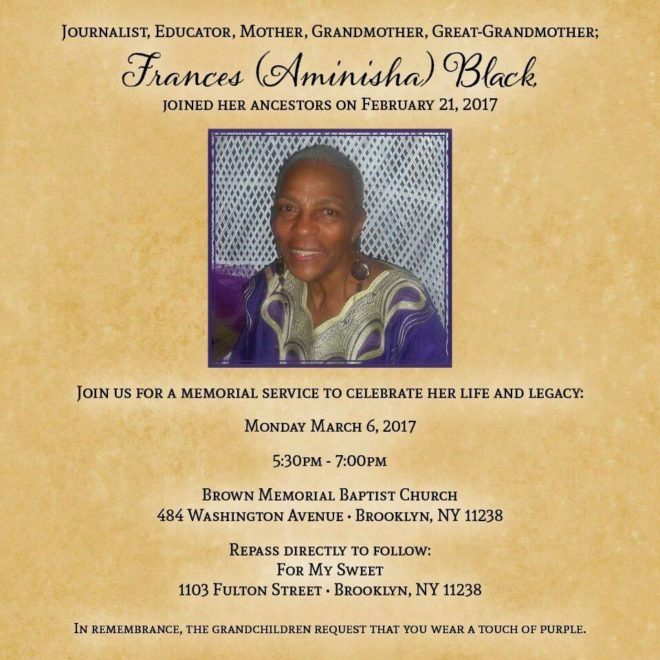 As Brooklyn’s pulse quickened with the currents of Black Power and African heritage, Aminisha bloomed into a kind and committed advocate. That was the start of a long love and marriage blessed with five children, in addition to Aminisha’s two young boys, Pamoja and Amani Fruster. The couple’s firstborn was Kweli, now a technical writer for a contractor with the MTA; then came Nandi, a New Orleans-based defense attorney; Makini, a high school guidance counselor in Atlanta; Hazina, a criminal justice professor in Birmingham; and son Kojo, an assistant principal at a junior high school in Brooklyn. Pamoja and Amani are deceased – pain that Aminisha must have channeled into the compassion for which she was known. But her legacy runs deep with 13 grandchildren and one great-grandchild. Although she and Jitu parted some years ago, she was proud that they were able to continue parenting successfully. He joined the ancestors in 2013. That sisterhood became a twin spine of The EAST as it flourished to become “a sample and example” of vision, unity, cooperative economics and creativity. Added to the day care would soon be a Saturday school for secondary students. When The EAST leased a vacant and cavernous local armory, Uhuru Sasa Shule (Freedom Now School) was born, becoming one of the first and most successful independent Black schools on the East Coast. Those who knew her well will tell you Aminisha always had a project in mind or in progress aimed at serving the community. She was a member of the Parents Advocacy Council based at Medgar Evers College, created Word Power League, a vocabulary initiative for third-graders and spoke of a Kwanzaa film festival she wanted to produce in the south. She was active in her block association and organized a regular and popular Scrabble tournament on the block. Her daughter Nandi says Aminisha was a master herself and that it was a family badge of honor if you beat Mama Aminisha at Scrabble. Her newsletter, “The Parent’s Notebook”, which became a long-running newspaper column in Our Time Press, was a uniquely enlightening and helpful one. It offered not only the expected nuts and bolts of education, agency, health and safety, but also addressed complex social, ethical, political and spiritual issues in an accessible manner. Publisher David Greaves valued the column as an enhancement of the paper’s brand. “Aminisha’s Parent’s Notebook column gave our readers a deeper understanding of life, with its possibilities and its joys,”” said Greaves. Block by Block was a project Aminisha envisioned to help achieve incremental but substantive community empowerment. Nandi says Aminisha envisioned it beginning with one block – her own – and being replicated on other blocks in the neighborhood, then in other neighborhoods, boroughs and so on. Nandi said, “My mother asked, ‘What if adults really knew what was going on with kids?’ She wanted to teach others how to engage people on the block, with adults concerned with and caring for the youth, whether or not they were family”. Aminisha was not able to bring this project to fruition before she became ill, but she has adult children who are educators and grandchildren who love her fiercely, so… you never know. Muslimah Mashariki said of her friend, “Aminisha’s impact on The EAST Sisterhood was that of a very principled and kind worker to look up to, an example of great integrity”. And Aminisha was devoted to the end to that sisterhood, attending as many reunions and vacations as she could and keeping in touch with the women – and also the men, with whom she’d built a meaningful and impactful life. “Her authentic way of seeing community life inspired me. To impart my wisdom and experiences to my students in a way that helps them move forward… it’s a very rich – not material – but meaningful life.